There’s always something which can make your life easier. Whether you’re stuck watching infomercials at 2 am through lack of sleep or discovering the wonders of the gimmick section of your local supermarket, the idea of a faster and easier path saturates every part of our daily lives. Even the coffee sitting on my desk could be seen as part of this hunger for convenience; I didn’t grind the beans myself, after all. Now, here at Process Street, we know just as well as anyone that, more often than not, any offer of help we are given with a too-good-to-be-true scheme turns out to be flawed. The ads that you see on clickbait sites, running along the lines of “I made $570 in 6 hours, and so can you!”, or some such nonsense, prey on this desire to save some of the time and effort we put into earning our daily keep. Despite all of this, finding easier methods and time-saving skips isn’t a bad thing. The desire for efficiency without extra effort can be incredibly useful in having a better day-to-day life, whether it takes the form of dodging traffic by taking the backstreets on the way to work or saving hundreds of dollars by going to a single price comparison website. Well, now you can take full advantage of the power of programming even if you have no experience or technical skill with computers. This little application will allow you to automate your emails, manage your social media accounts and much, much more, with the bare minimum of setup time. We present you with Zapier. To fully understand what Zapier is, we first need to take a look at APIs. An API (application program interface) is a medium through which computer programs can talk to each other. Don’t worry, we won’t go into the nitty-gritty technical details; instead, we’ll break it down in layman’s terms. Let’s say that you have one person who only speaks English (let’s call him Facebook) and another who only speaks German (we’ll call her Gmail). Usually, Facebook and Gmail wouldn’t be able to communicate with each other because of the language barrier. That’s where your translator (API) comes in. The API can speak all languages and so, with its help, Facebook and Gmail can talk to each other, and later share photos and contacts. If you’re still a little vague, take a look at this fantastic little video by the guys over at MuleSoft. Now, admittedly, by itself an API isn’t terribly impressive; it’s what you can do with them that makes them so useful. This is where Zapier comes in. Zapier allows you to easily use APIs for pretty much any purpose that you can think of, but (once again) we’ll simplify it for you. Everybody’s heard of the term “cause and effect”; if you heat bread it becomes toast and if you flick the right switch your lights will come on. Zapier follows this rule, except that it allows you to choose the cause and effect within a single process called a “zap”. For example, let’s say that your family were going to send you some holiday snaps via email, but you wanted them to be stored on your Dropbox account for safe keeping and easy access. With Zapier, you can set up a zap which will detect when you receive an email with an attachment (in this case your mom’s holiday photos) and automatically save them to your Dropbox. 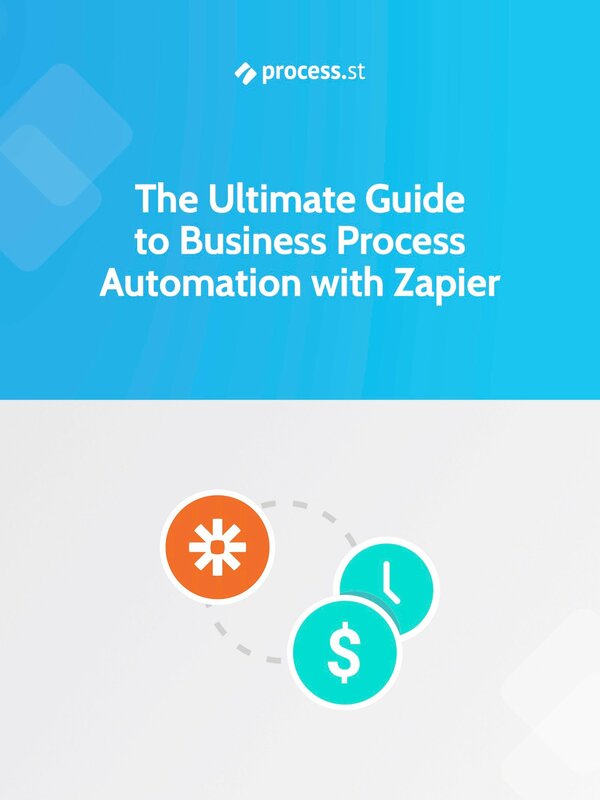 We’ll delve into the many uses for Zapier in a later post, so for now let’s just say that there are hundreds of different uses for this – from sharing posts on your social media to managing your accounts and automating your emails! At the heart of Zapier is the interaction between triggers and actions. If a zap is a cause and effect model, the cause would be your trigger, and the effect is the action. For the sake of ease, let’s take the previous example of saving your family photos to your Dropbox. In this instance, the trigger would be receiving the email with the photos and the action would be saving the photos to your Dropbox. Cause and effect. Now, this is all well and good, but for someone who’s completely new to the concept of Zapier (or even APIs in general), setting up these processes can be daunting. In my case, when I was first introduced to Zapier I pretty much had two left hands and nothing but thumbs; I was intimidated, to say the least. After using it for a while, however, I found that I couldn’t be more wrong. For the effort it takes to set up a Zap, you can save an insane amount of time whilst it runs happily in the background. To prove this to you, let’s go through the process of setting up your very first zap! To start things off, take a quick look at this video by Bill Dotson – although he’s walking through an older version of Zapier, this should help to clear up any remaining confusion about what Zapier does. Now, let’s get you going on the path to smooth running by showing you how to create your first zap. 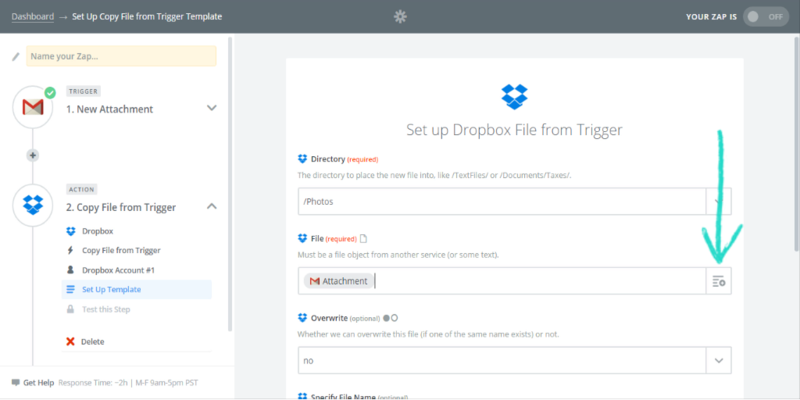 We’ll stick with the example of setting up a way for your email attachments (family photos) to automatically save to a Dropbox account. Once we’re through, you’ll never have to worry about digging through your emails to get those snaps of your mom and dad in the south of France again. 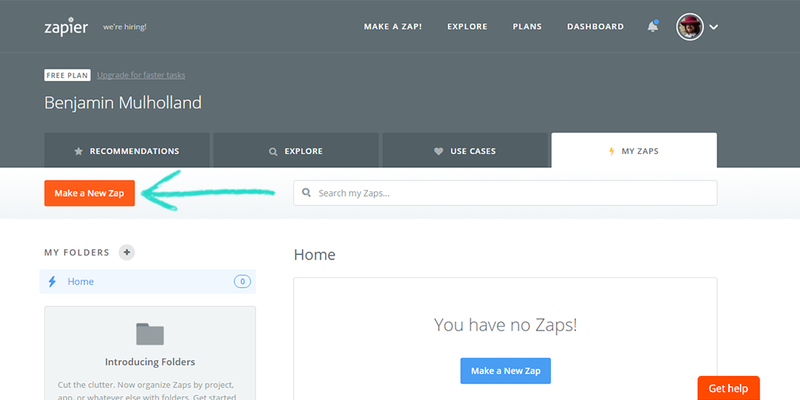 Once you’ve either logged into Zapier or created a new account, the first thing you need to do is to click on “Make a New Zap”. This will get you going on the path to an easier online life! 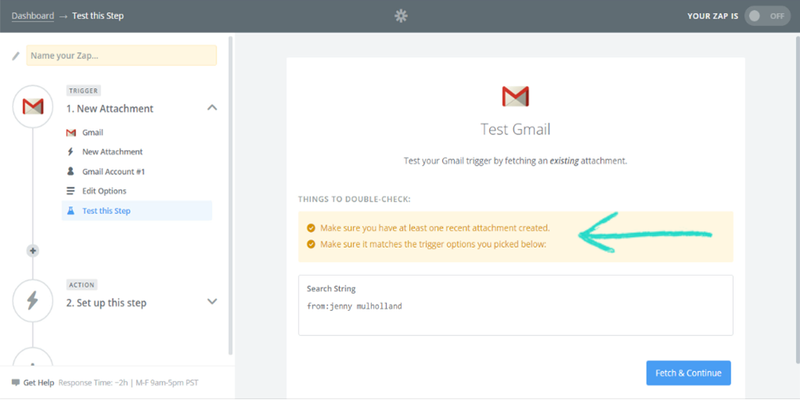 As previously explained, the trigger will be what Zapier is detecting to start the process you wish to carry out. 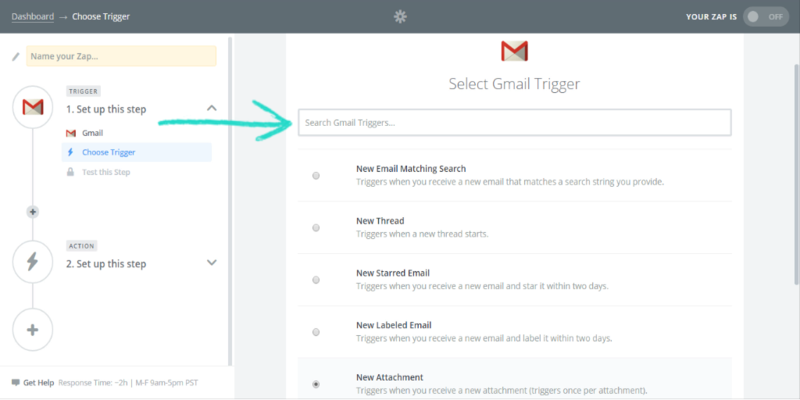 First you need to select the application which will host the trigger action. You can either scroll through the list of applications until you find your desired choice or use the search function (we highly recommend the latter). Once your program is selected, you must also state the task which needs to occur to start your zap. Search the scroll menu to find the desired spark. If the action is not present, try either using the search bar (for example, we’re looking for an “attachment” trigger) or clicking on “show less common options”, and have another look. 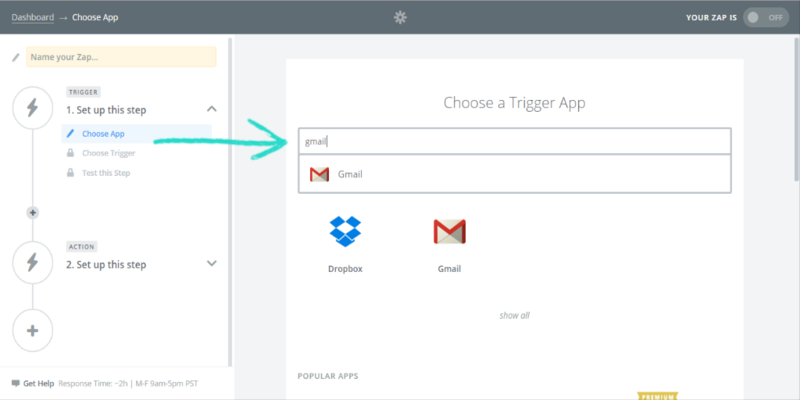 Now that you’ve selected your trigger app and action, you’ll need to give Zapier access to the account you own on that platform. For our family photos example, this would be our Gmail account. Just click on the “Connect a new account” button, then login or fill out your details. Once you’ve linked your account it’s a good idea to quickly test that the account is working by clicking “Test Account”. Next up are our email options! Essentially, this is all about focusing the zap onto a particular variant of trigger. 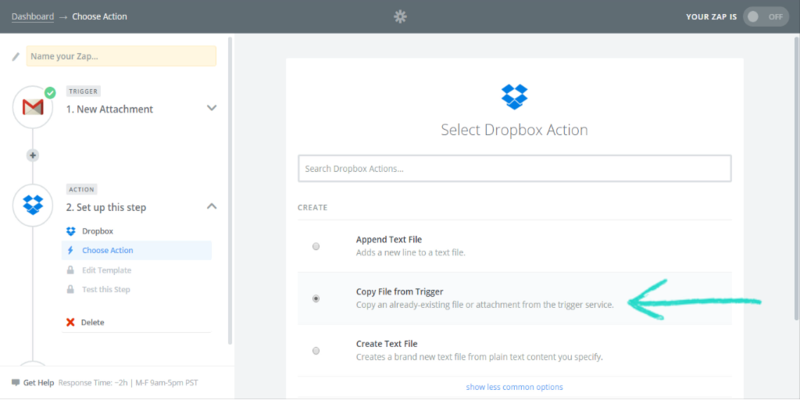 If that sounded like a bunch of mumbo-jumbo, think of it like this; you don’t want to be saving all of the email attachments you receive into your “Family Photos” Dropbox folder, right? 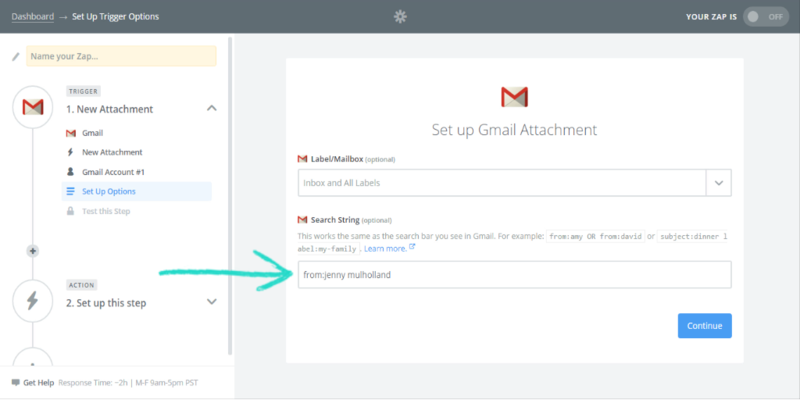 By setting your options to detect only emails from specific accounts or circles (such as family), you’ll ensure that only the attachments sent from their email address will be picked up. If you’re still a little lost with the whole concept, don’t worry too much as this step is optional, but we would highly recommend at least giving it a go, as it will really pay off in the long run. For our example of the family photos, you would enter “from:*family member’s account*”. Finally, you will be asked to test that the trigger is working, which may require a little preparation on the side of the trigger application itself. In this instance, Zapier needs to test itself on an attachment you have recently been emailed which fits the options you just set. Click “Fetch and Continue” to run the trigger and see if you’ve got everything set up correctly! Next up is the action which will take place when the trigger is set off. This step is much the same as selecting your trigger, but always remember that you’re now selecting the application for what will come out of the process. First, select the application which will carry out the action; once again, we recommend using the search feature. Now, much as with setting your trigger, you must choose what the action will do from the drop-down menu. Remember that more actions can be selected by clicking on “Show less common options”, or by searching for them. If you’re still following our example of family photos, the selection you’ll need is “Copy File from Trigger”, as you want your zap to copy the files attached to the trigger email. The first thing you need to do to beef out the skeleton of your action is to give Zapier access to the appropriate account. 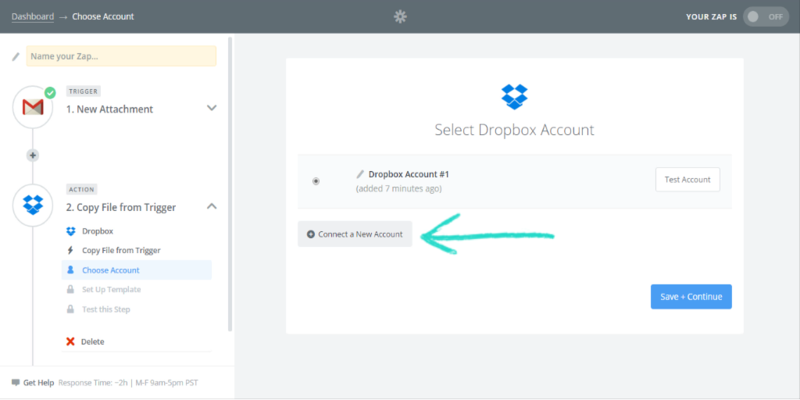 Clicking on “Connect a New Account” will bring up a pop-up in which you will need to both log into your account for the action (in our case, Dropbox) and allow Zapier to have access to it. Next you have to tell your zap exactly what it has to do with your account. 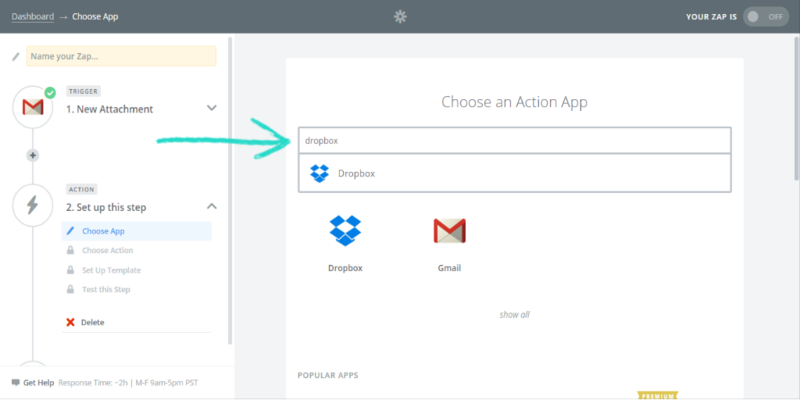 For the family photos, you need to select the Dropbox folder you want them to be saved in and state the naming system for each photo (we’ve just gone with naming the file the same as the photo you received in your email). You can bring up the selection of naming schemes by clicking the button at the far right-hand side of the “File” heading. Much the same as our trigger, the final step in setting up your action is to test it. Click on the “Create & Continue” button to run your test, and wait for the results! 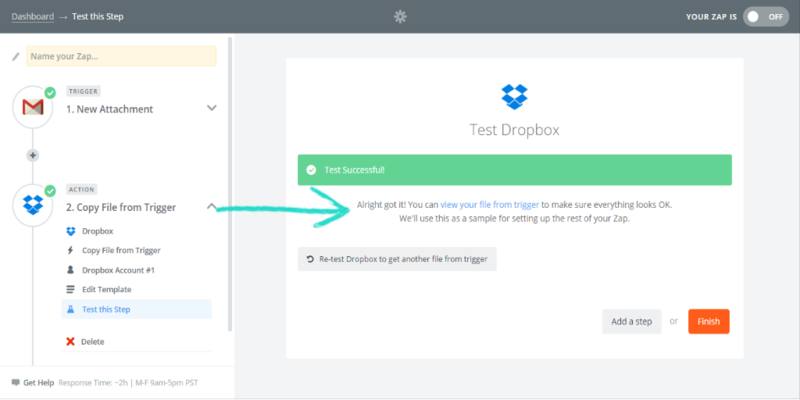 If you want to be thorough, this test will actually save a file (hopefully the attachment which served to test your trigger) into your Dropbox – head over there and see if the process has worked. Everything’s set up, and you’re positive that the Zap is working exactly as you want it to; the final step in creating your first Zap is naming it and setting it live. 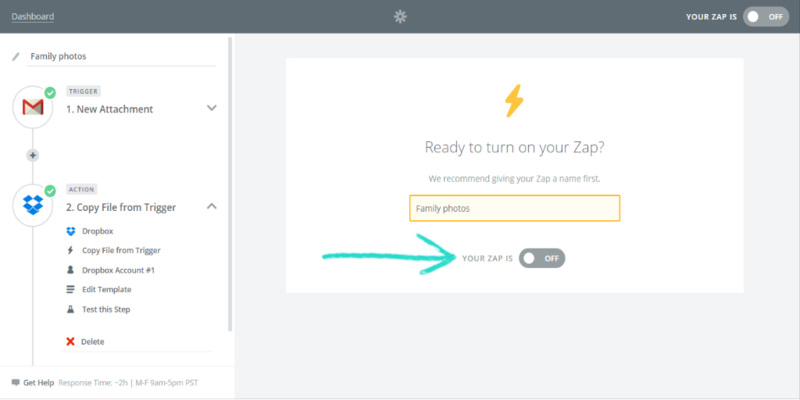 Set the name of your new zap to something which you will easily recognize (just in case you need to edit it later on), then flick the switch to make your life easier! Our warm-hearted congratulations on setting up your first – and hopefully not last – zap with Zapier. Your zap is happily chugging away, working in the background to make your day that little bit easier. However, that’s not quite enough to satisfy us in helping you relax; if you’re anything like me, waking up in a blind panic before realizing that you haven’t taken a GCSE exam in years, you’ll love the ability to periodically check that everything is functioning as it should. The progress of your zaps can be tracked in a couple of different ways – the first, and most obvious, is to make sure that your zaps are executing by checking that the actions are being carried out. Basically, check for what you set it to do. In our case, we checked that Zapier was detecting our emails with holiday photos attached, and made sure that those snaps were being put into our Dropbox folder. Alternatively, you can go to your Zapier dashboard and select “History” from the drop-down menu made by clicking the arrow on the right-hand side of your chosen zap. From this screen, you can see all of the zaps which have been performed (successful or not) and sort them by various categories, dates of execution, etc. If you want to keep track of your zap history in a spreadsheet, you can even download a CSV (lest we remind of our data-nerdiness). By clicking on any instance of a zap which has been run you will be shown what set off your trigger, and the action that was taken, along with a handy little summary of the success or failure of the zap. 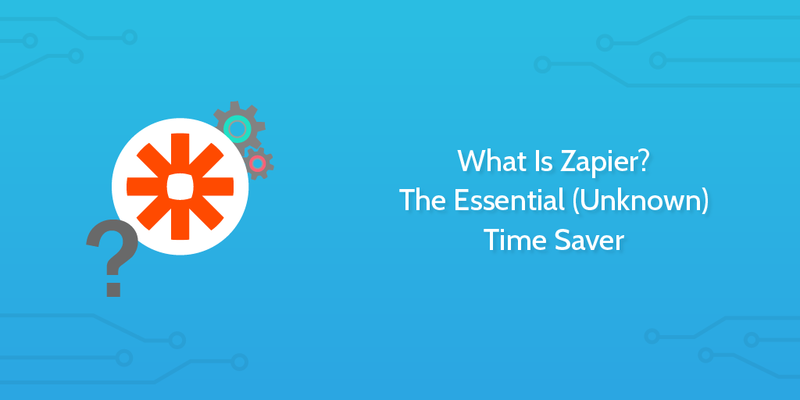 To round off our little “What is Zapier?” introduction, we’ll go a little beyond the basics and give you a peek at what this marvel is truly capable of. Sometimes you won’t be able to carry out the process you want to with a single trigger and action; this is where filters come in. 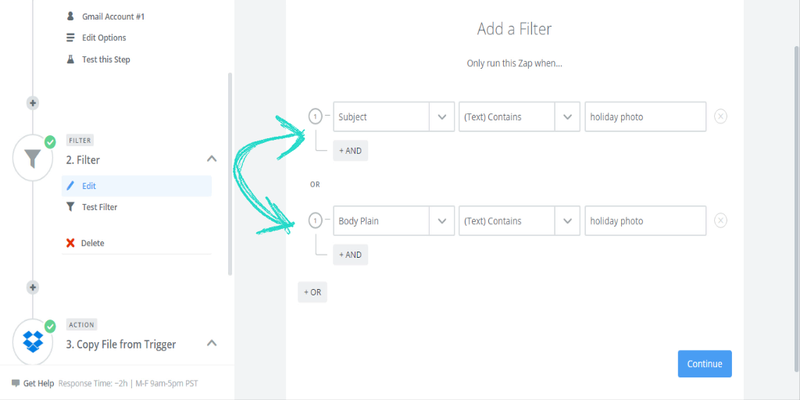 Clicking on the little plus symbol in your zap timelines when creating them will allow you to add your choice of another action or a filter. More actions are definitely useful, allowing you to do several tasks automatically from the same trigger, but filters allow you to limit your actions to only run under specific circumstances. For example, let’s go back to our ever-useful Gmail photo zap. At the moment it will run no matter what attachment is sent by Jenny Mulholland, saving all of them in the same place. With a filter, we can set our zap to only run within certain parameters. Let’s say that you asked your family member to include the words “holiday photo” in their email, if the attachment they’re sending is some holiday snaps. You would then be able to set a filter which would only let the zap run if the subject line or body of the email contained the words “holiday photo”. Through combinations of “and” and “or” filters (parameters which must either all be met, or only one fulfilled, respectively), you can turn even the most basic of zaps into a veritable army of automation. What is Zapier? The largest timesaver for commercial and public uses alike since Big Ben. If you enjoyed this post, have any questions about the Zapier basics, or have some nifty information to share, leave a comment and help others make the most out of their experience! I LOVE zapier… I have been a big fan forever. This is a great description of the platform and how it works. You should do a follow up posts on some of the zaps that you use to be more productive. Hey Meredith, thanks for getting in touch! Glad you enjoyed the post – like I said, Zapier was a little bit out of my comfort zone until I actually started using it. It’s so good! Also, you read our minds about the extra posts; we’ve got a string of in-depth Zapier material on the way. I avoided Zapier for a while, but when I saw they had a free version, I knew I had to dive in. I connected ChargeBee (who handles my subscriptions) and Process.st via Zapier. Now, when I get a new customer, it cteates a new checklist for my “New Customer Onboarding” process here on Process.st. Not only saves me a step, but helps me to check my new client onboarding progress. I have a feeling I will be soon using the paying tiers on Zapier. Hey R.J., thanks for getting in touch! That’s exactly the kind of thing which Zapier excels at; saving you time by taking care of some of the legwork. Now that they’ve implemented multi-step zaps, I’d really recommend grabbing one of the paid plans too. You can automate so much more with them, it gets insane with a bit of experimentation! I’ve been an enormous fan endlessly. This can be a nice description of the platform and the way it works. It is best to do a observe up posts on a few of the zaps that you just use to be extra productive. Amazing review about zapier ! Good job: you’re a zapier lover. I’m this close to get an account but I’m a little scared about security. When I use Gmail, there is none other applications which can “intrude” into. 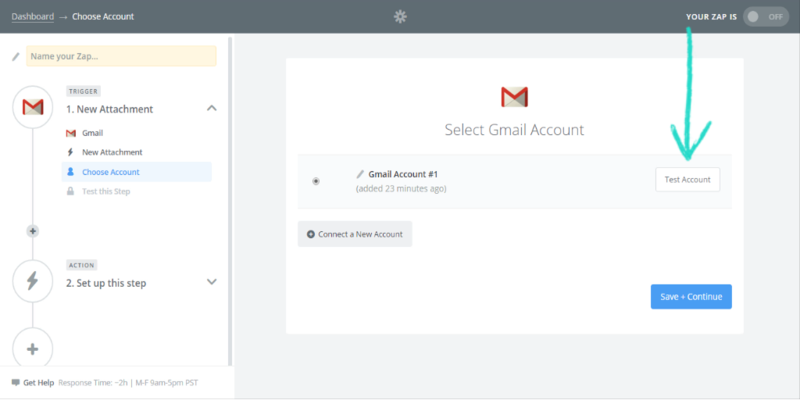 But on your screenshots, I can see that zapier gets access to all gmail folders (I know this is the purpose of zapier). I’m just a little embarassed about that. I’m very sensible about intrusion.